There is lots of database software available and all have pros and cons. Databases are the backbone of most of the systems we interact with daily. Databases have broad storing/searching functionality and allow for lots of interactions and calculations at the same time. Great for sales systems, e-commerce websites, accounting and more. The below will outline some of the most used database software systems used in Ireland. 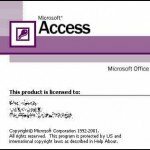 MS Access is often overlooked but as most large businesses already pay for it as part of their MS Office package, it is definitely worth a look. If your company currently relies heavily on MS Excel, MS Access is a great solution as it is best friends with MS Excel – this means that it sometimes allows for easier integration with your current software systems. There are downfalls with MS Access including the fact that it is not easily added to the cloud so is usually accessed on shared drives or with limited functionality (and for a large cost) through sharepoint. You can purchase MS Access by clicking the link. SQL Server is an excellent choice when processing and storing large volume of data. SQL server provides a database software solution that is highly scalable, and can be the ideal DB system in terms of capacity and efficiency. It has several features that aid regular DB maintenance like purging, shrinking and re-indexing. Some of the down sides includes the time taken to create specific views and the cost. You can purchase Microsoft SQL Server by clicking here. This database software solution is also highly scalable and is open source. MySQL Workbench offers visual tools for creating, executing, and optimizing SQL queries. Just like most database software solutions, it also allows for the reuse of SQL snippets, and enables developers to manage standard database connections, including MySQL Fabric. You can download MySQL Worbench by clicking here. This database software was built with the internet in mind. phpMyAdmin is usually available from hosting companies and is also available with cPanel. phpMyAdmin offers a great portal to create, edit or delete database objects. It offers all the usual database functionality and is the tool of choice for many website designers and platforms. in combination with PHP, it is an excellent software solution for cloud application testing. prior to creating the webpages that will interact with your database and display your retrieved data. You can download the latest version of firebird here. Oracle remains the choice for so many of the major business players that it has to be highlighted. Oracle has been around since 1977 and is arguably the biggest player in the database software providing scene. One of their latest projects, simply “Oracle Database” offers everything you would expect from the big players and are backward compatible. As a result, big business can easily upgrade their systems with minimum fuss. This means that oracle tends to only grow their business. One of the main disadvantages of oracle database is its complexity – it needs to be all things to all but this can also make it bulky. You can see more about Oracle Database by clicking here. There are many more database software platforms available but the above are the choice of many – especially in Dublin. Arrow Design can create bespoke database software solutions. We specialise in MS Access design but are experienced in databases of all shapes and sizes. We repair databases, backup databases, add functionality to databases and migrate databases to the cloud. If you have a database software need, we are here to help, just contact us. We are always happy to make software that it tailor made to your needs. We build around your needs so even if its an idea that has never been created, we are experts in gathering the right requirements to put your thoughts into actions. We create on all platforms to allow you get exactly what you need, for less than you think.